Mixes Agatha Christie with all the game genres. My tolerance for satirical games was pretty much obliterated by Eat Lead: The Return of Matt Hazard, but I'm pretty sure that Pony Island developer Daniel Mullins' next game The Hex will be at least interesting, and possibly great. Not least because PC Gamer gave Pony Island a staggering 91% in our review. The Hex is an Agatha Christie-style murder mystery about a group of shifty people trapped in a tavern during a raging storm. The barkeep learns that one of them is planning a murder, and...oh yeah, each character is based on a different genre. "In a creaky old tavern," so says the press pack, "in a dusty corner of the video-game universe, a storm is raging. The barkeep gets a patchy phone call. It's hard to tell what the caller is saying, but this much is clear: someone in this tavern is planning a murder. 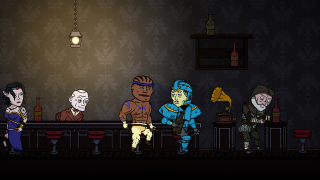 "There are 6 patrons of the tavern; all of them are videogame genre stereotypes gone wrong. There's The Spacemarine, The Sorceress, The Platformer, The Fighter, The Apocalypse Survivor, and The First Person Perspective. By exploring their memories you may discover the identity of the murderer...or you may find a much darker secret." Through flashbacks, you'll play the backstories of each patron, their memories taking the form of a platform game, a side-on brawler, an FPS etc etc. The Hex isn't due out until early 2017, but we already know the price ($4.99), and the stores it'll be on: Steam and itch.io. Oh and look, here's a trailer (ta, Eurogamer).